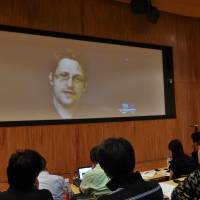 Edward Snowden, a fugitive and former U.S. National Security Agency contractor who leaked information from the agency in 2013, warned Saturday that all people in Japan are subjected to mass surveillance initiated by the U.S. government. Snowden lived in Japan from 2009 to 2011. At the time, he was an employee with computer giant Dell Inc. contracted out to the NSA, where he worked on a surveillance program at the U.S.’s Yokota airbase in Fussa, Tokyo. “They know your … religious faith. They know whom you love. They know whom you care about … This was our job to establish the pattern of life of any individuals,” he said. 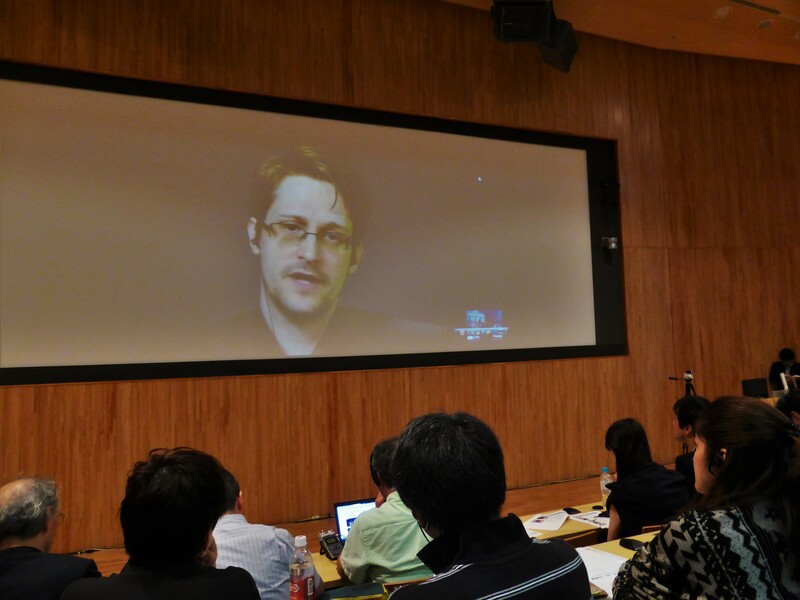 Snowden made the comments via video conferencing from Russia, where he resides to avoid U.S. criminal prosecution, during a symposium Saturday in Tokyo on surveillance in contemporary society. More than 200 people, including lawyers, journalists, and others, attended the discussion held in an auditorium on the University of Tokyo campus. Snowden, 32, said all the information that people input via cellphones or computers can be legally collected by the U.S. intelligence agency for analysis. Serious issues facing Japan are its lack of citizen engagement on privacy controls and weak civil controls over the government, he said. Officially known as the Act on the Protection of Specially Designated Secrets, which went into effect in 2014, the law gives ministries and agencies discretion to classify information in areas such as defense, counterterrorism and diplomacy as state secrets. Leakers, including civil servants, could face up to 10 years in prison and those who instigate such leaks, including journalists, could be subjected to five-year prison terms. The law was steamrolled through the Diet in 2013 by the administration of Prime Minister Shinzo Abe despite a mass public outcry over the obscure nature by which information will be designated as a state secret. In an interview with the weekly magazine Sunday Mainichi in its Tuesday edition, Snowden said the enactment of the controversial law was requested and designed by the U.S. government to facilitate the NSA’s espionage activities in Japan. To counter the government surveillance and control of information, Snowden called for solidarity in the media. “The purpose of a free press in open society is not to simply write down what the government wants to say,” but to actively challenge its authority, he said. Snowden said he wants to return to his home country if possible, but only under the condition that the U.S. offers a fair trial over his whistleblowing. “I don’t want to live in the world where everything … is tracked and monitored,” he said, adding people today need to work towards establishing a surveillance-free society for future generations.